Health and fitness applications (apps) for tablets and smartphones make it easier for patients to take charge of their healthcare. But with hundreds of apps to choose from, identifying which apps are best suited to an individual can be a challenge. “If an app is too complicated, or a patient doesn’t readily see that it is making a difference in their well-being, he or she is not going to continue using it,” says Ardy Haghighat, director of the UCLA Community Physicians Network. U Bar, a new service of UCLA Health, aims to improve on that. Located in the waiting area of the UCLA Health office in Woodland Hills, U Bar features three secured iPads that patients can use to explore more than two dozen recommended healthcare apps. “Our physicians tested and vetted dozens of apps in various health categories to find the best ones,” says Haghighat. Categories include nutrition, fitness, mental health, children’s health, pregnancy, smoking cessation and disease management. The physicians will continue to add new apps and categories in the future. 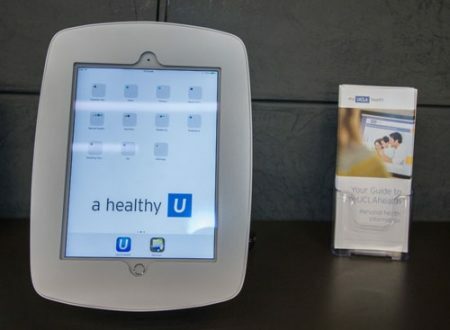 U Bar also promotes the latest in interactive health technology, such as apps that connect with wireless scales, blood-pressure monitors and blood-glucose monitors. “These can be great tools for patients and their healthcare teams. What we have found, though, is that patients often find these apps to be confusing or intimidating to use,” says Grace Wittenberg, assistant director of business development for UCLA Health Faculty Practice Group. To alleviate user apprehension, an on-site technology specialist can show patients how to properly use and get the most benefit from these apps. The retail location of the Woodland Hills office — at the outdoor Village at Westfield Topanga shopping center — made it an ideal spot for UCLA Health to launch its first U Bar for people interested in the latest tools to improve their health. “We are in a heavily-trafficked, highly visible area, and we want mall patrons — not just patients — to stop in and give U Bar a try,”says Haghighat. “We would like to bring U Bar to more UCLA Health offices and also launch a mobile service,” says Wittenberg. For now, a virtual U Bar is also available online at uclahealth.org/UBar.